San Fu paste is a Traditional Chinese Medicine prevention treatment dating from the Qing Dynasty. This treatment uses herbs ground into a powder, mixed with fresh ginger juice into a paste, then taped to points located either on the back or lower legs. These patches remain on the skin for 2-8 hours before the patient removes them. 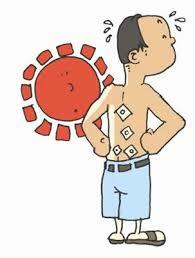 The treatment is traditionally done at noon (12-1pm) on specific days in summer according to the Chinese calendar. For 2017, the dates are July 12, July 22, and August 11 in 2017. For optimal benefits, the treatment sessions are repeated for three years. San Fu is sometimes translated as the “three hidings” since it references three 10-day periods that are predicted to be the hottest days of the year – or what we sometimes call in English “the dog days of summer”. Dog days are the hottest and most humid days of summer and the body’s Yang energy is at the highest level on these days. The treatment is given on the first day of each Fu period; so the patient comes in once every 10 days. If you or your loved ones are suffering from the issues above, please mark the dates on your calendar and call Tang Acupuncture at (770) 696-4675 for details.